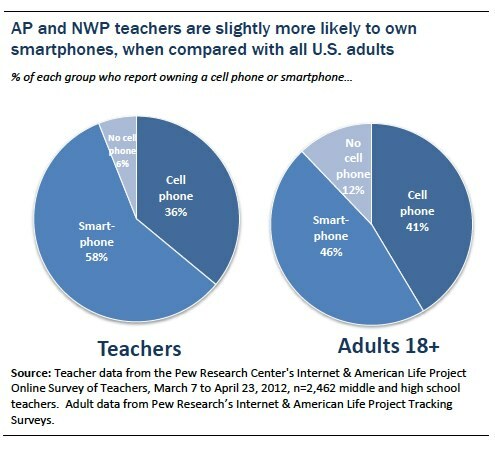 The AP and NWP teachers taking part in this survey are notably more connected to technology than the general adult population. More than half describe themselves as very confident when it comes to learning how to use new technologies, and this confidence is reflected in the gadgets they own. These teachers are twice as likely as the typical adult to own an e-reader, and they lead the pack in the mobile revolution. Almost all are cell phone owners, more than half own a smartphone, and the percent of teachers with a cell phone who use the phone to text (98%) is much higher than the national figure of 80% for all adult cell phone users. 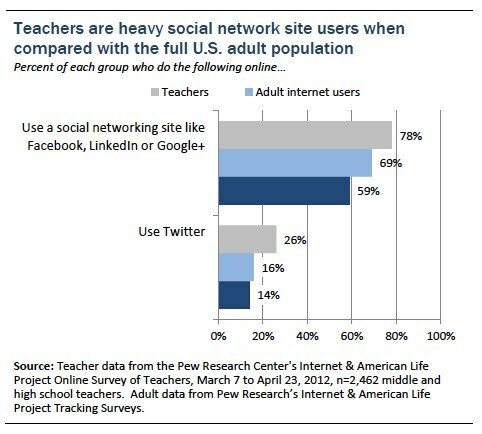 AP and NWP teachers are also more likely than the typical adult to use social networking sites and Twitter, and to engage in every online activity asked about in the survey. Despite being fairly advanced tech users, these teachers are less confident when comparing their tech savvy to that of their middle and high school students. Asked how they compare to their students when it comes to knowing how to use new technologies, just 18% say they usually know more than their students while 42% say their students usually know more. 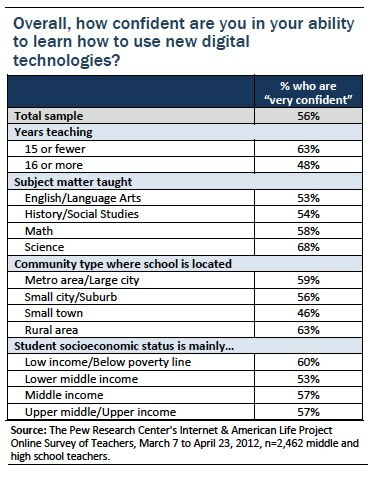 When compared with the total U.S. adult population, the AP and NWP teachers in this sample are more likely to own each of the seven tech gadgets asked about. These teachers particularly outpace all adults on laptop ownership (93% of teachers vs. 61% of all adults), desktop computers (87% of teachers vs. 58% of all adults), and iPods (78% vs. 44% of adults). They also report owning e-readers and tablet computers at much higher rates than the full U.S. adult population. 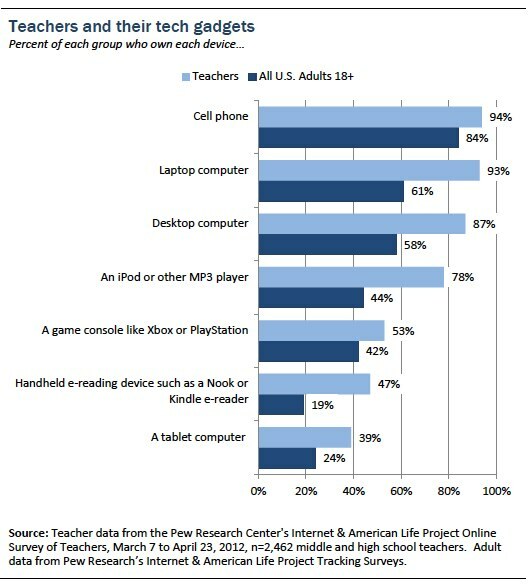 These teachers’ relatively high gadget ownership rates are to be expected, given their education and income levels. These two demographics have been consistently strong predictors of gadget ownership in Pew Internet’s research. Among this group of AP and NWP teachers, ownership of some gadgets varies considerably by age. 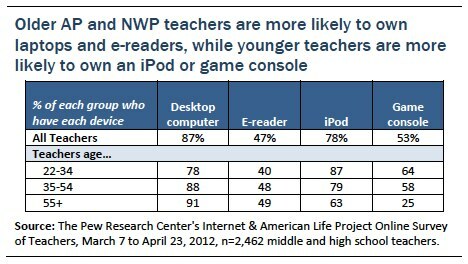 Older AP and NWP teachers are more likely to own desktop computers and e-readers, while younger teachers are more likely to have an iPod or a game console. Laptop and tablet ownership are fairly consistent across age groups. In some cases, teachers’ patterns of tech gadget ownership mirror the adult population as a whole. Among the full U.S. adult population, younger adults are most likely to own iPods and game consoles, and adults ages 30-64 have higher rates of desktop ownership than adults under age 30. However, in the full U.S. adult population, young adults are significantly more likely to be laptop owners, which is not the case among this group of AP and NWP teachers. And nationally, the youngest adults (ages 18-29) are more likely to be tablet owners than adults ages 50-64. Again, this pattern does not hold among AP and NWP teachers. 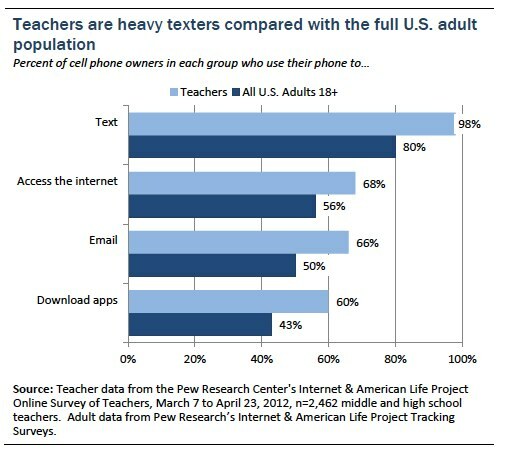 As with the full U.S. adult population, these AP and NWP teachers are very heavy cell phone users. Overall, 94% say they own a cell phone, which is slightly above the national figure of 88% for all U.S. adults. More notably, among this group of teachers, 58% say their phone is a smartphone. This is more than 10 percentage points higher than the 46% of all adults who report having a smartphone in the most recent Pew Internet survey in December 2012. Smartphone ownership is highest among the youngest teachers, with 68% of AP and NWP teachers under age 35 owning a smartphone. Just 47% of teachers ages 55 and older say their phone is a smartphone. A similar pattern holds among the full U.S. adult population, with younger adults more likely than older adults to be smartphone owners. Given the slightly higher rate of smartphone ownership among teachers, it is not surprising that they report using their mobile phones for various activities at higher rates than is the case among all U.S. adults. Almost all of the teachers in this sample who own a cell phone report using it to send and receive text messages (98%). And more than six in 10 use their phones to access the internet, send and receive email, and download apps. These percentages are all higher than those for adult cell phone users as a whole. Given the online format of the survey, all of the participating teachers are internet users. The same is not true among U.S. adults, for whom overall internet use stands at 85%. Therefore, throughout this section, teachers’ figures are compared to all adults but also to just those adults who use the internet. 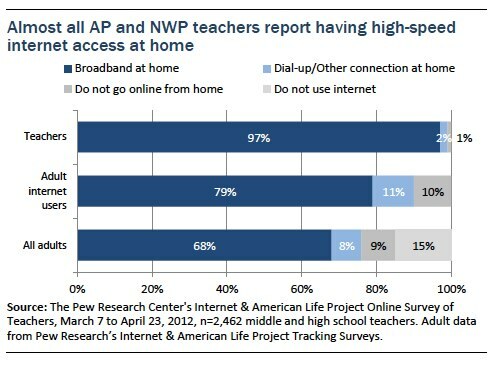 Among this group of AP and NWP teachers, 97% report having a high-speed internet connection at home. One percent report not accessing the internet at home, while the remaining 2% report having a home connection that is not high-speed. Nationally, 79% of adult internet users report having high speed connections at home, almost 20 percentage points lower. Once online, these teachers’ online activities mirror those of the full adult population, and include social networking, information seeking, video and media consumption, and content creation. The percent of AP and NWP teachers in this sample who use social networking sites such as Facebook or LinkedIn, as well as the percent who use Twitter, are considerably higher than the national figures for all U.S. adults. They are also higher than national figures for adult internet users. As is the case with both teens and adults nationwide, the most popular social networking site among teachers is Facebook, used by 73% of social networking teachers. Ranking a distant second in popularity among this group is YouTube (used by 32%), followed by LinkedIn and Google+ (each used by 28%). Asked how frequently they use social networking sites, more than six in 10 teachers who use these sites say they use them daily (30% at least once a day, 32% several times a day). Another 23% use these sites at least once a week, while the remaining 15% use them less often. 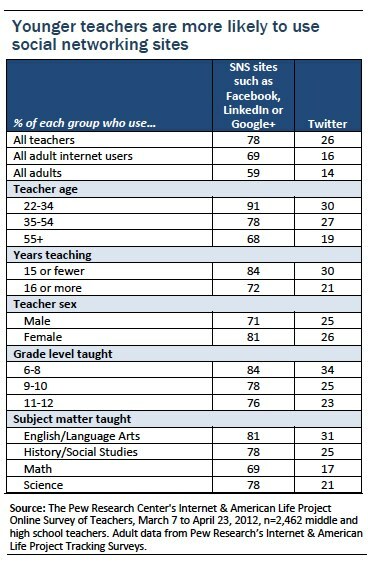 Among AP and NWP teachers, those most likely to report using these social networking tools are younger teachers (those under age 35). This mirrors the full adult population, in which social networking site use is highest among the youngest adults and lowest among the oldest adults. Female teachers are also slightly more likely to report using social networking sites when compared with their male counterparts, but there is almost no difference in Twitter use across male and female teachers. Among AP and NWP teachers, there are slight difference in SNS and Twitter use across subject taught (English teachers are most likely to use SNS and Twitter, math teachers least likely) and grade level taught (6th-8th grade teachers have higher rates of SNS and Twitter use than those teaching high school). Given the focus on students’ online information gathering, it is interesting to measure the extent to which their teachers rely on search engines and online encyclopedias for information. 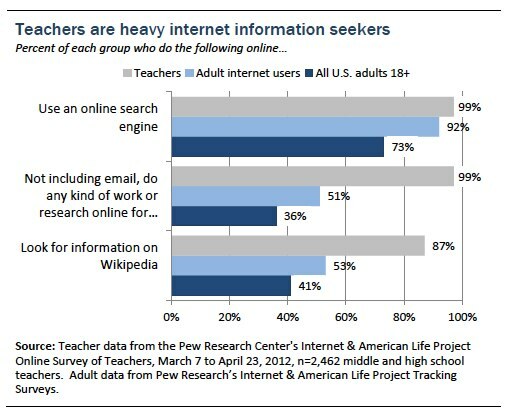 The survey finds that the vast majority of AP and NWP teachers use search engines (99%) and Wikipedia (87%) to find information online. The latter is particularly notable, because both teachers and students mentioned in focus groups that teachers commonly bar students from using Wikipedia in their school assignments. The survey also finds that almost all of the teachers surveyed use the internet “to do work or research for their job.” The specific ways these teachers use the internet as a tool for professional development and curricular ideas are discussed later in this report. Among all adult search engine users, Google is far and away the most used search engine and its dominance continues to grow over time. Yahoo places a distant second. Google is likewise the search engine of choice among AP and NWP teachers, with 90% naming Google as the search tool they use most often. Yahoo (4%) and Bing (3%) are the only other search engines cited by more than 1% of teachers. Compared with these national benchmarks for all adults, this population of teachers is even more confident in their own search abilities. Almost three-quarters (73%) of these middle and high school teachers say they are “very confident” in their own search abilities, with another 26% saying they are “somewhat confident.” Of the more than 2,000 teachers surveyed, only 1% describe themselves as “not too confident” when it comes to using search engines. These teachers mirror the general adult population in that younger teachers have more confidence than their older counterparts in their search abilities. Eight in ten (80%) of the youngest teachers (those under age 35) say they are “very confident” in their search abilities, compared with 75% of teachers age 35-54 and 63% of teachers age 55 and older. While these teachers have greater confidence than adults as a whole in their search abilities, they have considerably less faith in the accuracy of the information they find using these tools. Just 5% of teachers participating in the survey say that “all or almost all” of the information they find using search engines is accurate or trustworthy, compared with 28% of all U.S. adult search users. AP and NWP teachers are also very different from adults as a whole in that the youngest teachers have less faith in the accuracy of search results. Among the general population, younger adults tend to have more faith in the trustworthiness and accuracy of the search results they get. Half (50%) of teachers ages 22-34 say that all or most of the information they find using search engines is accurate or trustworthy, a figure that rises to 61% among teachers ages 35-54 and 68% among those age 55 and older. AP and NWP teachers use the online encyclopedia tool Wikipedia at much higher rates than U.S. adult internet users as a whole (87% vs. 53%). Wikipedia relies on user-generated, crowd-sourced content, a process that sometimes calls the accuracy of its information into question. In focus groups with teachers and students prior to the survey, Wikipedia was noted as a tool teachers discourage or bar students from using because of concerns about the accuracy and reliability of user-generated content. Students explained that while teachers often disallow Wikipedia as a formal source on assignments, it is still often their first stop when researching a topic online. Students value Wikipedia as a place to get a short, straightforward summary of a topic at the beginning of an assignment before going to other sources. Wikipedia use does not vary across teachers of different subjects, grade levels, or community types. There is only the smallest variation in Wikipedia use between younger and older teachers, with younger teachers slightly more likely to use this tool than their older counterparts. Nine in ten teachers under age 35 (90%) say they use Wikipedia, compared with 87% of teachers age 35-54 and 85% of those age 55 and older. 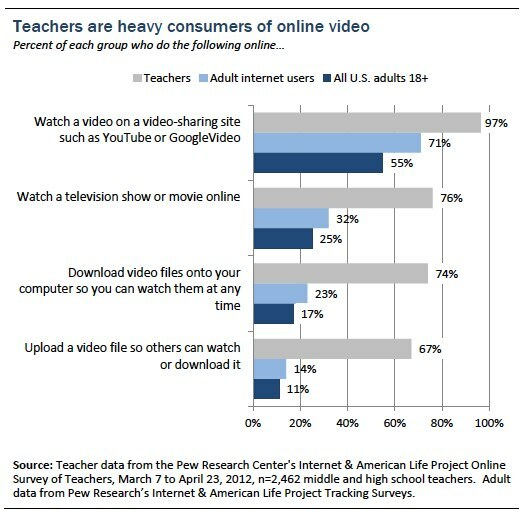 Still, this group of teachers stands out in their online video consumption, with 97% using video-sharing sites like YouTube, 76% watching television shows or movies online, and 74% downloading videos to their computer. Another two-thirds (67%) upload videos for others to consume. Patterns in online video consumption among these teachers are different than those for the full adult population. Nationally, young adults (those under age 30) lead the way in all of these online video activities, often by very wide margins over older adults. Yet among AP and NWP teachers, the only pronounced age differences appear for “watching television shows or movies online.” The percent of AP and NWP teachers who watch television or movies online drops from 87% among 22-34 year olds to 63% of those ages 55 and older. 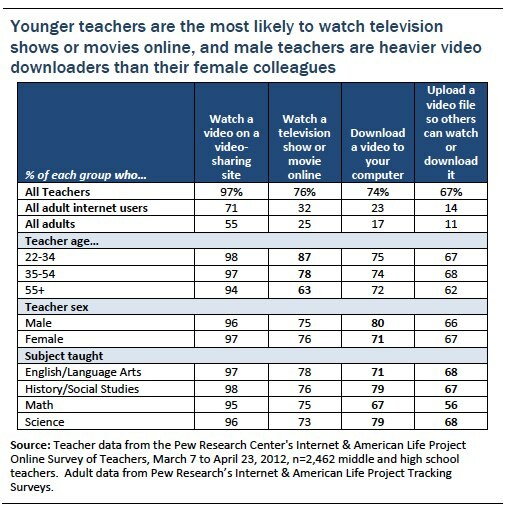 Still, older teachers in this sample are watching television shows and movies online at much higher rates than other adults their age. In 2009, just 16% of online adults age 50 and older were watching television shows or movies online. Male teachers slightly outpace female teachers in downloading video, as do History/Social Studies and Science teachers when compared with English and math teachers. Math teachers also report the lowest rates of video uploading when compared with colleagues who teach other subjects, which may be partly due to their lower rates of social network site use. The survey shows that AP and NWP teachers are especially likely to engage in online content creation when compared with adults as a whole. This includes creating their own website, having an online journal or blog, and remixing material they find online into their own creations. In the general population, content creation activities are generally more popular among younger and middle-aged adults. The same is true among AP and NWP for two of the activities asked about in the survey; blogging and creating one’s own webpage. Both of these activities are more popular among younger teachers than older teachers. Remixing online content varies only a few percentage points across different age groups of teachers. Some of the biggest differences in content creation activities are found when comparing teachers who specialize in different subjects. 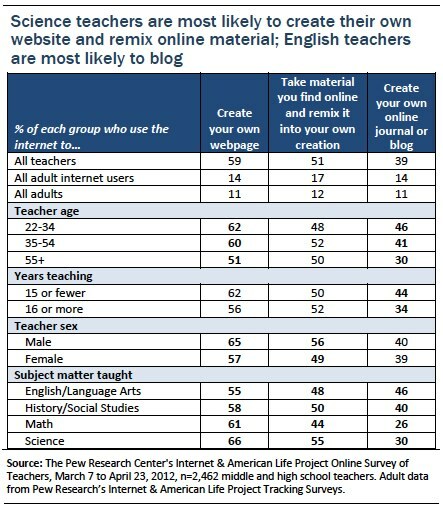 Science teachers have the highest rate of remixing material they find online and creating their own webpage, while English teachers are the most likely to have their own blog. 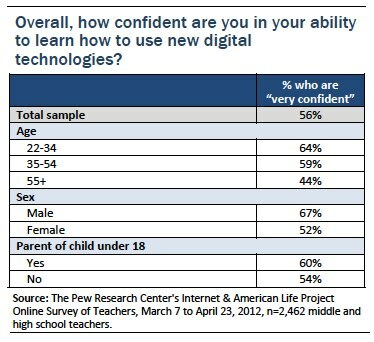 Asked how confident they are in their ability to learn to use new digital tools and technologies, more than half of AP and NWP teachers (56%) say they are “very confident.” Another 39% describe themselves as “somewhat confident” while just 5% say they are “not too confident” or “not at all confident” in this area. A teacher’s age has a particularly pronounced relationship with their confidence using new digital technologies. Younger teachers are much more likely to say they are “very confident” in this area when compared with older teachers. Male teachers are also particularly confident when compared with their female counterparts, as are teachers who have children under 18 living at home when compared with teachers who do not have young children living at home. Tech use confidence among these teachers also varies by how long they have been teaching, subject matter taught, the type of community in which their school is located, and the socioeconomic level of their students. Science teachers stand out on this question, with 68% saying they are “very confident” in their ability to use digital technologies. Moreover, 63% of teachers in the earlier stages of their careers feel “very confident” in using new technologies. When looking at community type, rural teachers express the most confidence while small town teachers express the least. At the same time these teachers express confidence in their ability to learn to use new digital technologies, 42% say they are less knowledgeable than their students in this area. Just 18% of these teachers say they usually know more than their students when it comes to knowing how to use digital technologies, and the remaining 40% feel they and their students are on par when it comes to knowing how to use digital technologies. 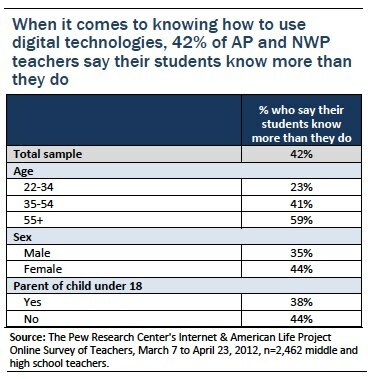 Just under one-third of these AP and NWP teachers (30%) say that they “often” or “very often” get ideas from their students for how to incorporate digital technologies into the learning experience, yet this practice appears to have no relationship to whether teachers feel their students are more knowledgeable than they are about these tools. The percent of teachers who regularly get ideas from their students about how to incorporate new technologies into the classroom is consistent across those who feel they know more than their students, those who feel students know more, and those who see themselves and their students on par in this area. It is also consistent across all major demographic subgroups, grade and subject taught, years of teaching, community type and student socioeconomic status. Among this group of teachers, those most likely to feel their students are more knowledgeable about new digital technologies are those age 55 or older (59% say their students know more than they do), female teachers, and those who do not have young children at home. These are the same groups who express the least confidence in their ability to learn to use new digital tools. 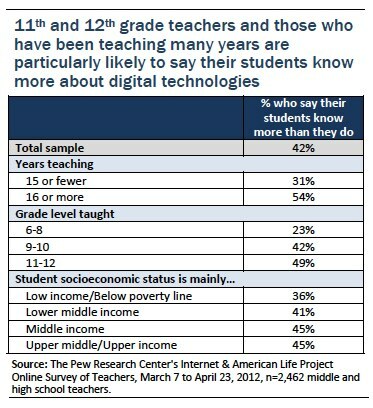 Also particularly likely to feel their students are more knowledgeable than they are when it comes to using digital technologies are AP and NWP teachers who have taught more than 15 years, those teaching 11th and 12th graders as opposed to younger grades, and those teaching mainly middle and upper income students.